Solutions providers should use SSRS 2008 performance tools such as ReportViewer, Report Designer or Report Builder 2.0 to develop reports and data for customers. Solutions provider takeaway: New to SSRS 2008 are ReportViewer and Report Designer enhancements, which assist with performance and organization, respectively. These tools will offer more convenient options for creating and reading reports. The ReportViewer control was updated in SSRS 2008 to work against the new ROM and the RPL (Report Page Layout) format that is generated by renderers. Some of the rendering load is handled by the client-side controls, which helps with performance and scalability. The WebForms/WinForms controls request output from the RPL renderers and then generate HTML/drawing to the screen based on the RPL. To increase performance, there is a new setting for PageCountMode, which can be Actual or Estimated. If it is set to Estimated, the total page count is not calculated upon rendering the first page. The ReportViewer control shows a question mark (?) in place of the total page count and changes it to the actual page count when the last page is displayed. Report Builder 2.0 (RB 2.0) is the new end-user report-authoring tool for SSRS 2008, but you must install it via either the SSRS 2008 feature pack or by installing the SQL Server Service Pack 1. Go to www.microsoft.com/downloads and search for "Report Builder 2.0." RB 2.0 is a full-fledged Report Designer that lives outside the Visual Studio environment, and unlike RB 1.0 this version doesn't have a requirement for metadata models to act as data sources. The definitive feature for RB 2.0 is an Office 2007 Ribbon-like user interface. End users can use this tool to publish report and data sources directly to the Report Server or a SharePoint site when the Report Server is running in SharePoint integrated mode. NOTE: Report Builder 2.0 can be used to edit and save all reports regardless of whether they were designed in the BIDS Visual Studio--oriented Report Designer or via Report Builder 1.0. RB 2.0 supports all the new design, visualization, and rendering features of SSRS 2008. End users can create reports with multiple data regions and pull data from multiple data sources. Figure 4.18 shows a sample report in RB 2.0 with its Office Ribbon-style authoring environment. 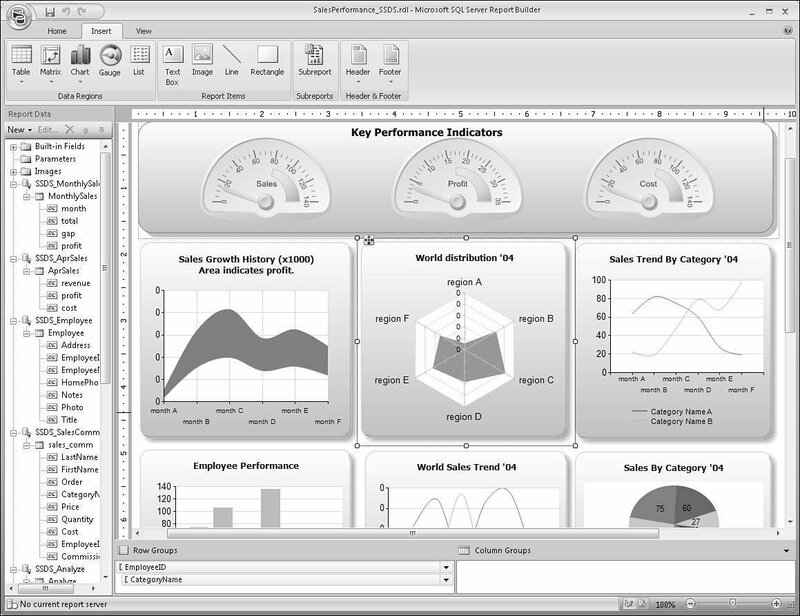 FIGURE 4.18 Report Builder 2.0 Office Ribbon-style UI. RB 2.0 is intended to eventually replace Report Builder 1.0 in later releases. Tablix is a new data region item that has been added in SSRS 2008 to provide a flexible grid layout and to combine the best of Table and Matrix controls. Figures 4.19, 4.20, and 4.21 show examples of how report layouts from SSRS2K5 can be combined into a more powerful Tablix layout in SSRS 2008. Tablix improves report layout flexibility and provides a more consistent rendering behavior. It can support multiple row groups and column groups. Groups can be nested, adjacent, or recursive. The Tablix data region automatically adjusts to include rows and columns for displaying group and summary data. One way to think about it is that SSRS 2008 Tablix = SSRS2K5 Table, Matrix, and List controls with added features. Report Designer provides templates for Table, Matrix, and List that can be dragged from the toolbox, and under the covers all these actually generate a Tablix data region in the RDL. 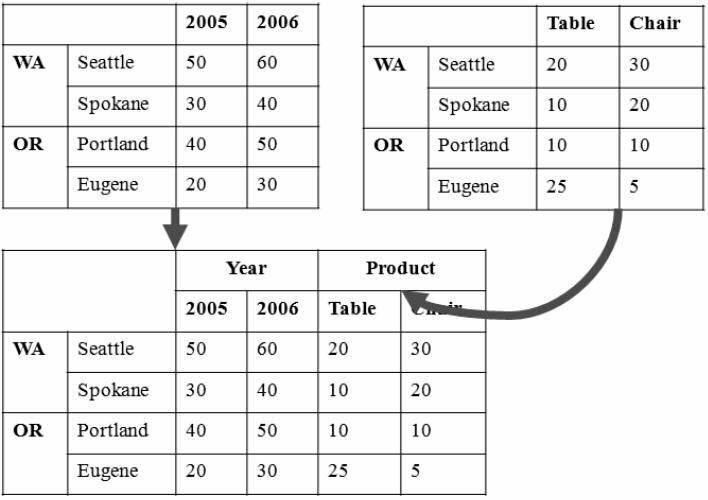 You can extend a simple table with matrix-like features or extend a simple matrix with table-like features. To learn more about Tablix, see Chapter 13, "Working with Report Items." FIGURE 4.19 Tablix example: hierarchical rows with dynamic headers. FIGURE 4.20 Tablix example: mixed dynamic and static columns. 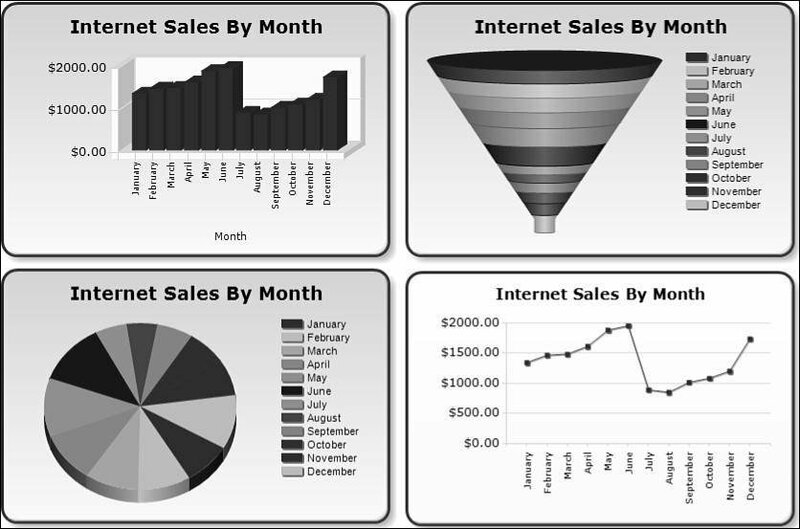 SSRS 2008 includes a redesigned Chart control that allows many new chart types, such as histograms, pareto, pyramid, funnel, bar/column cylinder, polar, radar, stock, candlestick, range column/bar, smooth area/line, stepped line, and box plot. Figure 4.22 shows a few examples of charts. NOTE: Dundas Software is a company that specializes in data-visualization software for Microsoft technologies. Dundas controls have been popular with SSRS2K5 customers. Microsoft bought the code base for Dundas data-visualization controls such as Chart, Gauge, Calendar, Map, and Barcode. Chart and Gauge controls have been integrated into SSRS 2008 and are available at no extra cost. Other controls, such as Map, will be added to SSRS in later releases. FIGURE 4.21 Tablix example: parallel dynamic groups. Charts have a much improved user interface with enhanced series, secondary axes, automatic interval labeling, tooltips, drawing effects, and many other features that have been popular with Dundas Chart controls. 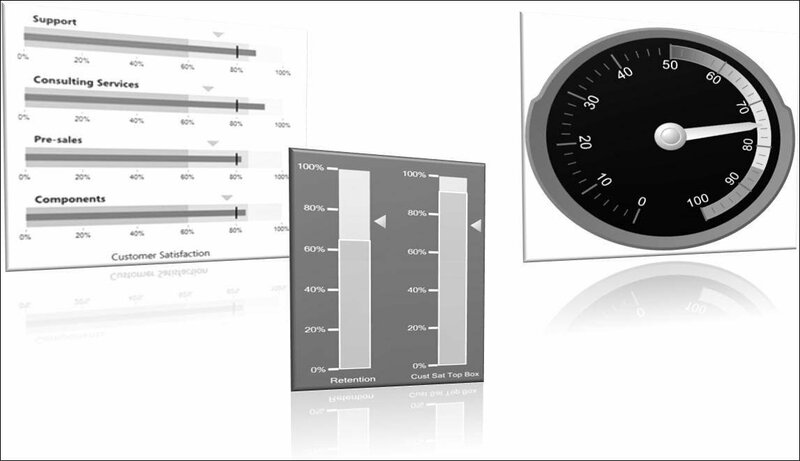 A new data-visualization control is available from SSRS 2008 for gauges to provide a highly visual way to emphasize key performance indicators. A gauge uses a pointer to show a single value and can have different visual representations such as a linear or radial gauge or even a thermometer gauge for indicating temperature. A range can be added to highlight a subset of values on the scale, and multiple gauges can be added in a single gauge data region. Figure 4.23 shows examples of gauges. 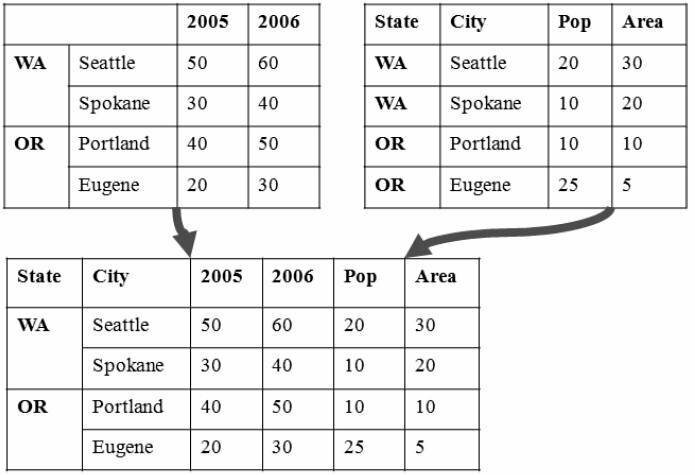 To learn more about charts and gauges in SSRS 2008, see Chapter 13.